Readers have been asking for 'autumn colour' photos so … I went on a two-day photo shoot. 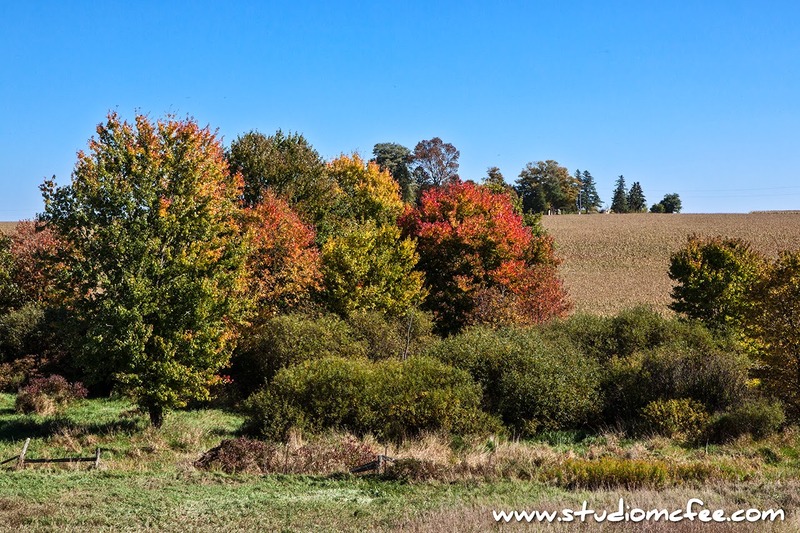 I traveled to some favourite locations: the Forks of the Credit, the Hockley Valley, the Elora Gorge, and the rolling hills of Wellington & Dufferin Counties. As I looked for interesting colour, I discovered that it wasn't just the trees that spoke to me. Autumn's palette includes much more than yellows, oranges and reds. The browns of bean and corn fields, juxtaposed with the blue autumn skies, made a splendid backdrop for brightly coloured trees. And, so far, green remains dominant helping the brighter colours to show off. Life played a little joke on me. I drove all the way to the village of Rosemont expecting to have dinner at The Globe only to learn that the restaurant is closed on Tuesdays. Funny. Not so funny is the number of gravel pits that have been left as open sores on the landscape. Somehow I had understood these quarries were to be re-naturalized, the topsoil put back, trees and grass planted. Either that's not the law or it's not being enforced. Nevertheless, with the exception of the gravel pits, it was a splendid two days with bright clear skies and no humidity. Southwestern Ontario never looked better. Stay tuned for a series of autumn photos. This is the first in the series.